Mafube Local Municipality mayor, Jabulane Sigasa has taken a step to insure that community needs are responded to and fulfilled by the municipality. 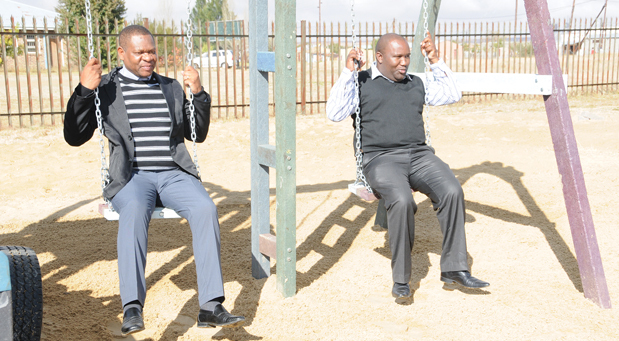 The municipality has completed the first phase worth R200 000 for kids park. The initiative was funded by Sasol in Qalabotjha location in Villiers in the Eastern Free State. The park, which was launched last year during a mayoral imbizo, will cater and respond to safety issues raised by residents. Sigasa said the last phase which will include an admission block and braai stand will commence in the coming financial year. “There are various reasons that led us to realise the importance of having a park in this area. Members of the community requested this park for the safety of their children after school because they had no place to play except the streets where they were not safe. Moreover, it was a question of removing unlawful dumping site near our people because it was too risky for their health. It was also posing high risk for elders who attend the clinic nearby due to the smell that use to come from it. It was not good at all,” said Sigasa. He urged community members to utilise the park for their benefits. “It is advisable for parents to know where their children are at all times. Leaving them in the park will ensure that any parent can relax and be able to do other things knowing that the child is safe and guarded while playing,” added Sigasa. One resident, who volunteered to look after the park, Pastor Abram Mphuthi, said he felt like contributing to insure the safety of kids in the community by looking after them and cleaning the park. “I am part of this community and also have five children who also spend time here and that made me feel a need to play a role in the safety of this children,” said Pastor Mphuthi. The park accommodates about 100 kids a day.